Crap beer: it’s a blank canvas! 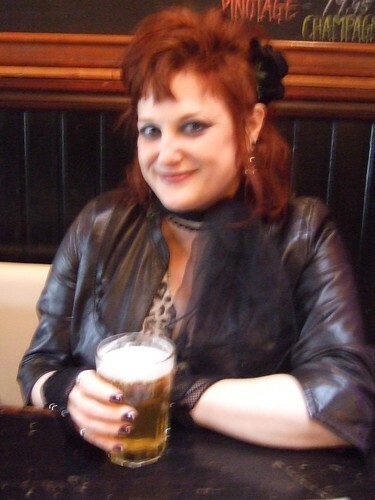 Here is a terribly blurry picture of me drinking “Garlic Beer”–one of my guilty pleasures at Garlic and Shots. It’s basically generic lager with crushed garlic floating in the head. I consider it a health drink. Lime in a Corona. A wedge of lemon in a hefeweizen. If you’re a girl, these are probably the first beers someone sets in front of you. Maybe a shandy, if you started early. And this is one of the benefits of being a lady— you can put stuff in your beer and no one will look down on you for it. I mean, any more than they already are. I would consider plopping a shot of soju into a glass of Hite–a Korean “beer bomb”. I could also see myself adding some Jagermeister to a pint of Guinness. I might add some whisky to my Sassquash mild to give it some lifeblood. Do you ever put anything in beer either to get you happy faster, or to improve a mediocre pint? Do tell.